7Plus is an Open Source software for the Windows 7 operating system that adds many features to the system to speed up your workflow or improve certain features of the operating system. It is a tweak software at its core that provides you with options to change core Windows features. The feature set of the program is divided into Windows Explorer, general Windows related tweaks, window handling and misc features. 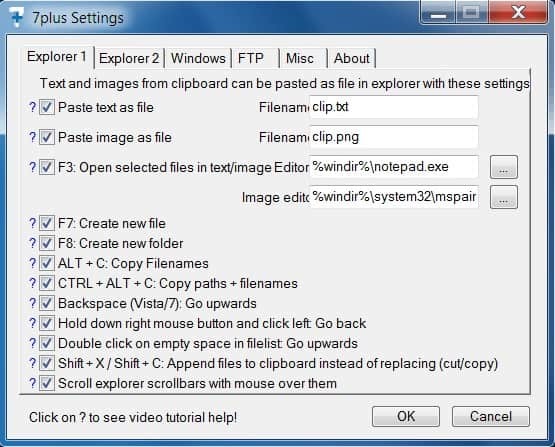 Some examples of what 7Plus adds include folder favorites in Windows Explorer, shortcuts to create folders, to paste text or image clipboard contents into a file automatically, enabling ftp server uploads with a shortcut, a clipboard manager storing the latest ten entries or displaying the Windows Task Manager when double-clicking on empty space in the Windows Taskbar. The developer has created instructional videos that demonstrate the functionality of several of the features of 7Plus. Each feature can be disabled in the settings window of 7Plus so that only those that you may require need to be activated. All you need to do is check or uncheck tweaks to enable or disable them on the system. Double-click on empty space on taskbar to run a program. Close programs on the taskbar with a middle-click. Middle-click on title of program window to close program. Right-click on title of program to set to "always on top". Add new Explorer keyboard shortcuts, e..g F7 to create a new file, F8 to create a new folder, Alt-C to copy filenames, or Ctrl-I to invert the current selection. Show free space and size of selected files in the status bar. Select first file automatically when a folder is opened in Explorer. Automatically check "apply to all operations" checkboxes. 7Plus is a well though out application that makes it a lot easier to work with Windows on a daily basis. The program is compatible with most 32-bit and 64-bit editions of the Windows operating system. Some features are OS specific, this is always mentioned next to the option in the program's settings. The portable program uses between five and six Megabytes of computer memory while running on our 64-bit Windows 7 test system, an acceptable value for the wealth of features that it brings to the table. Please note that some features may not work if you run it on newer versions of Windows. Update: The program has been updated several times ever since it was first published on the Google Code project website. You can read more about an update that introduced 64-bit program support and another one that added hotkeys and Explorer tabs to the software program. Please note, however, that the program's last update dates back to 2012 and that it has been abandoned by its author. I’ve used a couple of alternative file managers, but I’ve always returned back to Explorer because I found most of them lacking in terms of system integration (control panel, special folders, Explorer still getting launched by other programs), so I decided to improve Explorer instead. What exactly are you missing? I’m probably going to implement all reasonable suggestions when I think they will add to the value of the program. Wow, that’s cool! On my Win & installation I’ve installed XYplorer. It’s interface resembles XP’s Windows Explorer more, which gives me a much better feeling than the Vista/7 style with loads of unused space. – Shortcut for new folder and new text file (7Plus can already do this). – Shows filesize information of multiple files in the statusbar like in XP, MS decided to remove all filesize info from the statusbar. (Actually, now that I looked at it, it seems to have returned, perhaps during an update? However, if you select a few files it doesn’t show info anymore until you click ‘show more details’). – When inside a folder, show size of all files inside folder, like in XP. – Being able to set a starting location when opening Explorer. – Hide the libraries as I don’t use them. – When dragging to select, not selecting while hovering over empty space after text. Hmm, those are a few things could think of now. Thanks very much for even considering! Ow and I just noticed it’s impossible to choose another text editor. The dialog box that pops up keeps jumping back to favorites when opening another folder. Same happens for image editor. I’m using Win 7, x64 Dutch. File size and free disk space info are added with my program, you need to enable the statusbar though (and preferably disable the bulky new bar that was added in Vista). By doing this, there is not much wasted space anymore. You can set start location, atleast if you start it with the taskbar icon. I’m not sure if you can set a start location for win+e, but I might add that as a feature sometime. Libraries can be hidden with some registry tweaks, just google for them. Not sure what you mean with “jump to favorites”, the browse dialogs work fine for me. 64 bit versions might cause problems in some areas, I haven’t tested on those yet. Thanks for the answers Chris. After actually opening the program I found the filesizes. Two things though: how do I disable that bulky bar? And the filesizes are flickering very fast (I was downloading on that HD). How can I set the start location for an icon on the quick launch bar (I disabled those 7 taskbar things I didn’t like)? In the past I’ve tried some methods by going to the properties, but I always end up in the same screen. I will try to find aregistry tweak for the libraries. As for the dialog box: whenever I click on a folder, the dialog jumps to a specific location, instead of the folder I selected. On the left there’s a favorites menu where you can add favorites, it jumps there. Hi, I am not exactly sure what you are saying in the video demonstrating creating files by pasting something. Are you saying “cut paste” or “plus paste”? I could not understood how to make new files by pasting something. Do I have to press Ctrl+V or something else in win explorer? Do you mean the video linked here? You can paste images and text files from the clipboard with CTRL+V in explorer. Ya I mean the video linked here. Actually I was not able to paste the clipboard data because Ctrl+V was disabled. Now it is working fine. Thanks a lot for this great utility. You can disable the bar by going to organize->Layout, there you can enable/disable it. I might have to lower the free disk space display frequency, good point. I’m still not sure about the dialog box thing, I haven’t been able to see this here, but I will try to reproduce it. The bar is now gone, it was one of those menus I’ve never used. I searched some more for default location and found %windir%\explorer.exe /n,E:\, which works the way I wanted. I just noticed the going to favorites also happens in Explorer itself. To test I closed 7plus (exit), but it didn’t happen then. When I re-opened 7plus it happened again. Serious issues if you use slidewindows on a few windows, good luck ever getting older windows back. Hopefully they’ll fix this soon. Meanwhile, even a reboot won’t fix it as it’s apparently stored the “open to” position for the window as offscreen. A right-click on the program on the taskbar, select “move” then use your arrow keys trial-and error to bring the application back onscreen will fix it. how do i REVERSE the effects of 7plus? i can’t get it to make tabs or to make new fast folders or to remove the two sample fast folders [0:computer & 1:c:\] from the toolbar. i installed by extracting the archive into a folder and running 7plus.exe. made most of the “recommended” settings and let it restart explorer. when i found that it would not make tabs nor react to my ctrl-[numpad] and alt-[numpad] fast folder commands, i decided to go back to normal. When you open the settings window, are there any entries in the events tab? If not, please import all xml files from 7plusDirectory\Events. i can add/remove fastfolders now. Cool that it works for you now. I’m not sure why, but for some people the events didn’t load properly the first time. Feel free to post comments or bug reports on the project page, or mail me at fragman at gmail dot com. thanks! i’ll drop by the project page later. i _finally_ [*blush*] read the about tab on 7plus … the links there make it pretty clear how to best contact you. I’m an AutoHotKey user, and a BIG believer in automation. What do you have a computer for, if you spend half your time clicking and navigating just to get what you want? I thought computers were supposed to make things easier! Boo to Microsoft for not really thinking things from that perspective.